The awful human tragedy that is northern Japan following the earthquake and tsunami is also an opportunity to question the assumptions built into many American news reports about our own country. Reporters who ask the right questions and dig will find that the assumptions permeating what Washington politicians say range from faulty economics to utter nonsense. 1. How will Japan finance rebuilding? Japan's ten-year notes currently pay 1.27% interest, down from an average rate of 1.39% over the last decade, according to Bloomberg Business News. Just as in America, as government debt grew, interest rates went down. Japanese economic rules channel vast amounts of savings into government debt, so much that the pressure on interest rates was downward even as debt grew because the economy was not growing and more yen were piling up than could be put to work profitably. Japan has twice the debt of the United States relative to the size of its economy. In 2001 Japan's debt was 135% of its annual gross domestic product or GDP. Now it is almost 200%. At the start of 2001 the U.S. government's debt was about $5.7 trillion or 55% of GDP, while at the start of 2011 it was about $13.6 trillion or about 92% of GDP. The federal government's average borrowing rate has fallen by a bit more than half since 2000. 2. Why would interest rates fall as debt grows? Why aren't interest rates rising? Interest represents the rental of money. Think of renting a home or apartment from a landlord. Same thing. Expense to one side, income to the other. When there are more vacant housing units than would-be renters then rents fall. When there is more cash than borrowers (or equity investors) can put to work interest rates fall. As Adam Smith, the father of market economics, taught more than two centuries ago, confusing money and wealth is a common fallacy. America, like Japan, is awash with money with no profitable place to invest because people do not have enough income to acquire more goods and services, known as aggregate demand. Money plentiful, wealth not growing so much equals falling interest rates. When the interest rate is lower than the rate of inflation cash loses value. In effect, lettuce at the bank rots, just like lettuce in the refrigerator. Interest rates tell you about the future. Low interest rates mean there is little economic growth so a dollar today will be worth close to what a dollar will be worth a year from now. If we had robust economic growth interest rates would rise. If Japan needs to raise more money it can raise interest rates. Doubling rates would bring them to 2.54%, a very low rate by any standard in the last century. 3. Who will loan money to the Japanese government, given its debt? The Japanese people and corporations first and, if needed, the rest of the world. Borrowing from its own people, who are prodigious savers (unlike Americans), will be easy. Japanese economic rules funnel lots of savings into a government-debt system with limited alternatives. To attract new sums the government could just pay a bit more interest, which would also help deal with other problems caused by low interest rates, which are also prevalent in America, including low incomes to those people living off their savings. 4. How will Japan pay for this debt? First, rebuilding northern Japan will produce an economic boom. The Japanese build some of the best earthmoving gear and their civic, civil, mechanical and other infrastructure engineers are tops. TOKYO (Dow Jones)--Japan's outstanding public debt hit a record Y919.151 trillion at the end of last year, the Finance Ministry said Thursday, likely fueling concerns over the nation's fiscal health and adding to a sense of urgency within the government to quickly formulate a tax hike plan. Can you imagine any dispatch from Murdoch's Wall Street Journal or Fox News declaring without attribution or ridicule "adding to a sense of urgency within the government to quickly formulate a tax hike plan"? Japanese Prime Minister Naoto Kan's administration has been talking about raising taxes, and significantly, for more than a year. Indeed, when he was finance minister he spoke about it, but in terms much of the press misunderstood. "I had a strong feeling that we should never let Japan fall into a situation like the one suffered by Greece,’‘ Kan said last July, shortly after becoming prime minister, which brings us to the next point. 4. Is Japan like Greece? Is it burdened with debts and no ability to repay them without crushing increases in taxes and debilitating withdrawals of the commonwealth services on which economies depend? No, Japan is not at all like Greece, which leads to two crucial facts very few write about. One is that Japan has a pretty good tax system in that cheating is not the norm, while cheating is the standard in Greece, especially by the affluent and rich. In America the Republican leadership and the new Tea Party members of Congress want to cut the IRS budget by 5%, a gift to tax cheats, especially the most sophisticated cheats. Greece could solve its debt problem with less pain if it had its own currency. But because it is on the euro, instead of the drachma, it cannot adjust the price of its currency to work its way out of debt. Japan does not have a currency problem in borrowing because almost all of it's borrowing is from its own people and is denominated in the national currency, the yen. 5. What will rebuilding Japan mean for America's economy? One effect will be reduced output, temporarily, of Japanese vehicles for export to the United States, while Japan will likely increase imports of American-made goods, especially any the Japanese cannot temporarily make enough of to rebuild cities, infrastructure, factories, etc. This should, at least for a spell, reduce the roughly $50 billion annual negative spread between what we export to Japan ($117.5 billion in 2009) and what we import ($167.4 billion). 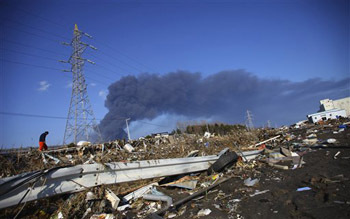 I really think this is so devastating for Japan and all across the areas that got affected by this tremendous tragedy. We have really high hopes that japan as well as hawaii and others will pick up with time and be almost the same they where. We have all of you guys in our prayers and for all those who lost there lifes. There's always a reason why, but this was unexpecting and another surprised from mother nature. This is the most insightful commentary I have seen on the Japan crisis anywhere. Yes, our hearts go out when we see the horrible pictures from Japan. But they have an huge upside here, if they engage in steady QE, and aggressively rebuild their nation. They could break the back of the perma-deflation they are in. This upside story should be the one we tell now. Kudos to Mr. Johnston. You forgot one of the most important tools that goverment has. Printing more money and devaluing all the money currently held. He's right that Japan can spend all it wants and not concern itself with funding, but for the wrong reasons. The actual reason is that under close examination, govts the spend their own currency that they issue are best thought of as spending first, and then taxing or borrowing. From inception, the funds to pay taxes and to lend to the govt (not that it needs it at all) necessarily come from govt spending and/or govt lending.